We will learn how to find the quotient in division of a decimal by a whole number. (i) Divide as in division of numbers ignoring the decimal point. 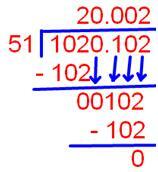 (ii) When you reach the tenths digit, place the decimal in the quotient. Note: When the number of digits in the dividend is less and the division is not complete, keep adding zeroes at every step till the division is complete as in example 1 and example 2. This example shows that both dividend and quotient have decimal place i.e. 1. 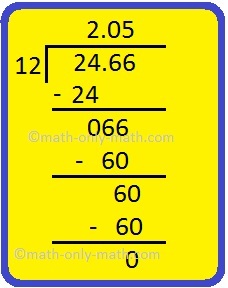 First we will divide the decimal by the whole number ignoring decimal point. Now put the decimal point in the quotient in such a way, that the decimal place in the quotient becomes equal to the decimal places in the dividend.